At age eleven, he had just begun to play the saxophone. At age twenty he was leading a revolution in modern jazz music. At thirty-four, he was dead from years of drug and alcohol use. Today, Charlie “Yardbird” Parker is considered one of the great musical innovators of the 20th century. A father of bebop, he influenced generations of musicians, and sparked the fire of one of the most important and successful American artistic movements. Born in 1920 in Kansas City, Kansas, Charlie Parker grew up just across the river in Kansas City, Missouri. By age twelve he was playing in the high school marching band and in local dance hall combos. It was then that he first heard the new sounds of jazz. Hanging around the Kansas City clubs, the young Parker went to hear every new musician to pass through. Some of his earliest idols were Jimmy Dorsey, Coleman Hawkins, Lester Young, Ben Webster, and Louis Armstrong. As a teenager he married his childhood sweetheart, Rebecca Parker Davis. Living in Kansas City, they had a child, but as Kansas City declined as a center for jazz, Parker longed to leave his hometown for New York. So, just around age twenty, Parker sold his horn, left his family, and hopped on a train to New York, where he was destined to change the face of American music forever. In New York, Parker had difficulty finding work at first, but playing with Jay McShann’s band he began to develop his fiercely original solo style. Within a short while he was the talk of the town and Dizzy Gillespie and other members of the Earl Hines band convinced Hines to hire him. Gillespie and Parker became close friends and collaborators. Of the time Gillespie recalled, “New York is the place, and both of us blossomed.” Leaving Hines, the two moved on to Billy Eckstine’s band, where they were able to expand their range of experimentation. The seeds of modern jazz, or “bebop,” as the new style came to be called, were also being sown by now legendary pianists Thelonious Monk and Bud Powell, drummers Kenny Clark and Max Roach, and trumpeter Miles Davis. All were frequent Parker collaborators on recordings and in the lively 52nd Street clubs that were the jazz center of the mid-1940s. Beyond his amazing technical capacity, Parker was able to invent a more complex and individual music by disregarding the four- and eight-bar standards of jazz and creating solos that were both fluid and harsh. Though the experiments of jazz were being heard worldwide, in the United States much of the popular media ignored the music and concentrated on the culture — the berets, horn-rimmed glasses, goatees, and language that characterized the bebop style. Jazz critic Leonard Feather noted, “There was no serious attention paid to Charlie Parker as a great creative musician … in any of the media. It was just horrifying how really miserably he was treated. And this goes for the way Dizzy Gillespie was treated — and everybody.” Due in part to dissatisfaction with the amount of critical attention he was receiving and in part to his years of on and off drug use, Parker slipped into serious addiction. On a two-year tour of California, his drinking and drug addiction worsened, and for six months he was in a Los Angeles rehabilitation center. It was not until his tour of Europe that Parker began to receive the attention he deserved. Visiting Paris in 1949, Parker was greeted with an almost cult status. His European trips also encouraged him to expand his musical arrangements, including backing strings for both touring and recording. However, as continuing personal and creative pressures mounted, he went into a tailspin: drinking, behaving erratically, and even being banned from “Birdland,” the legendary 52nd Street club named in his honor. Throughout this time, however, one thing remained intact — Parker’s playing continued to exhibit the same technical genius and emotional investment that had made him great. In 1954, while working again in California, Parker learned of the death of his two-year-old daughter, and went into further decline. He separated from his then common-law wife, Chan Parker, and was reduced to playing in dives. The cheap red wine he had become addicted to was exacerbating his stomach ulcers, and he even once attempted suicide. 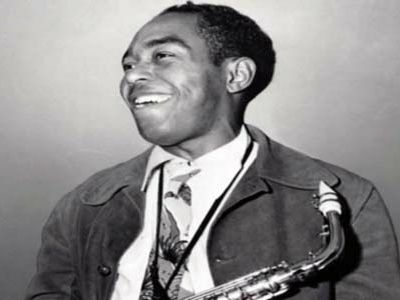 On March 9, 1955, while visiting his friend, the “jazz baroness” Nica de Koenigswarter, Charlie Parker died. The coroner cited pneumonia as the cause, and estimated Parker’s age at fifty-five or sixty. He was only thirty-four. Though Parker was a titan among jazz musicians of the time, it would take the country at large years to learn that for a short while in the 1940s and 1950s one of the most profoundly original American musicians had walked among them virtually unrecognized.